Treat your mouth to refreshingly delicious Ice Breakers Ice Cubes Peppermint gum. 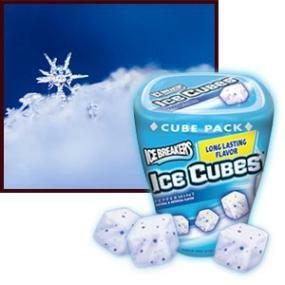 These frosty, cube-shaped pieces of gum have an instant cooling effect and are loaded with dazzling flavor crystals. The convenient pack fits right in your favorite cup holder, so you can always enjoy these unique pieces of gum, no matter where you are! Pop a piece of Ice Breakers Ice Cubes Sugar Free Peppermint Gum while you’re in the car! You’ll always arrive at your destination with fresh breath! Share the invigorating minty burst of Ice Breakers Ice Cubes Sugar Free Peppermint Gum with friends, family, and coworkers. They’ll love the refreshing experience of the Ice Breakers flavor crystals! Before you meet someone new, pop a piece of cooling Ice Breakers Ice Cubes Sugar Free Peppermint Gum to make a fresh first impression! In 1995, the Ice Breakers brand became the first to offer intense stick gum with revitalizing flavor crystals. Four years later, Ice Breakers Mints were born. From there, fruit flavors joined the mix with the introduction of Ice Breakers Sours in 2005, and Sours Gum in 2007. Since then, Ice Cubes Gum and Ice Breakers Duo have also entered the Ice Breakers lineup. Today, each of its great-tasting mints and gum delivers dazzling tastes and a mouth-freshening lift.